Pyracanthus (Pyracantha): growing, planting, caring. Easy to spot from far - with its coloured berries. Should you come closer, check out the thorns, and beware. Pyracantha is a genus of large, thorny evergreen shrubs in the family Rosaceae, with common names firethorn or pyracantha. They are native to an area extending from Southwest Europe east to Southeast Asia, resemble and are related to Cotoneaster, but have serrated leaf margins and numerous thorns - Cotoneaster is thornless. The plants reach up to 6 m (20 ft) tall. The seven species have white flowers and either red, orange, or yellow berries. The flowers are produced during late spring and early summer - the berries develop from late summer, and mature in late autumn. 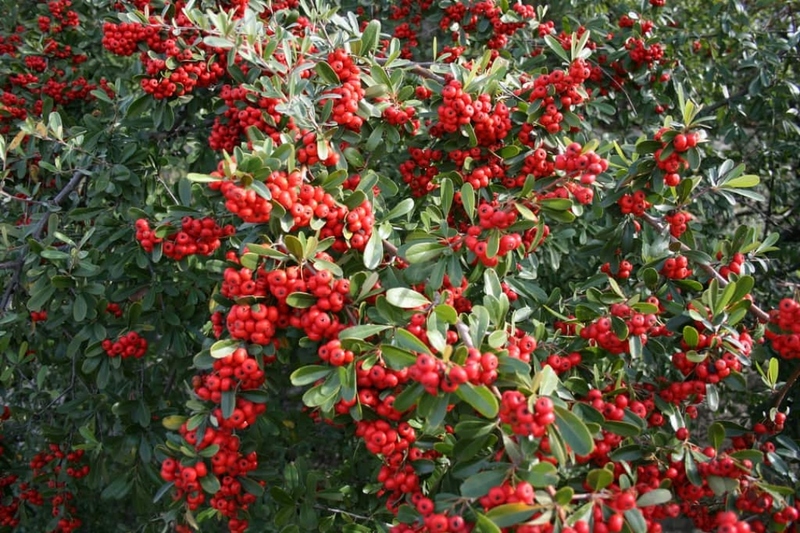 Pyracantha is a shrub with evergreen foliage, alternate, with oblong leaves, without petiole. At the end of spring it forms white flowers with five very numerous petals, pendulous corymbs. The twigs end with thorns, which are actually the buds of the next year. In autumn the flowers are transformed into numerous red, oranges or yellow berries. The shrub has a spontaneously large habit, with several trunks at the base. Plant the pyracanthas from October to March out of freezing period - a planting before the winter allows a better rooting - in a sunny situation. Pyracantha gracefully accepts any type of soil. In hedge, separate each one at least 80 cm to 1 m for a hedge about 2 m high. Before planting, prune damaged roots and branches to balance root volume and aerial volume. Plant in a hole at least twice as big as the root ball. Soaking the roots before planting will greatly improve the chances of recovery. Plant being careful not to bury the base of the trunks. Form a bowl around the base that will be used for watering during the first months. Tamp the soil around the roots - do not hesitate to use all the weight of the body! Finally water until filling the planting bowl, at least two watering cans! Water copiously the first few weeks. Beyond the first year, you shouldn't need to worry about it. Water copiously but infrequently to encourage the root system to seek water deep underground. It's therefore suitable to water until the planting basin is full and only empties slowly. In hedge, prune your shrubs in spring and in fall. Trim twice a year to never work on large twigs, and have a better result. The first years be patient, cut closer to the trunk than the final distance you expect; your pyracanthas must branch out regularly. Otherwise you will never get a dense result on the whole surface. If you already have a very old hedge of pyracanthas and you regularly see the death of some plants, there is a solution. The all hedge must be shortened by 20 cm in all directions, to allow the light to reach inside the foliage. For isolated shrubs, the principle is totally different! Only trim once a year, and remove the forks from the center branches to let the light in. If necessary, you can also shorten the outside branches with a pruner, not a hedge trimmer! Pyracantha can be a victim of fire blight, which is caused by a parasitic bacterium. In case of attack cankers on the bark appear, and the leaves and the flowers become black. If it happens your plant is lost, it must be cut, and burned without delay to limit the spread of the infection. Disinfect your tools well afterwards.